This book, and the ability to learn my methods of generating wealth through The MillionaireMaker Brains Trust, is my way of taking you by the hand and leading you step-by-step from wherever you are in life now. I want to give you the knowledge, tools and guidance you need to reach your financial goals. Yes, even your loftiest, most ambitious goals. The purpose of the book is to condition your mind and affect your behavior to prepare you to cross the threshold into a completely new level of living. I’ve made a special effort to sort through my own path-to-riches library to pull out the nuggets and dispense with the fluff. Because many people are unable to absorb a lot of new material if it’s presented in theoretical terms or long chapters, I made the decision to give you each concept in small, easy-to-read, and retain, segments. And a lot of the material is written with memorable stories to make it even more meaningful. This means that every concept is broken down into basic elements and presented in a clear and understandable way on one or two pages. It’s so easy, even school children can understand the simple principles presented. The real advantage to you is that anytime you have a spare moment, you can quickly read the next page or two. Each idea stands alone as a valuable prompter you can put into action. As you move through the book, you’ll see how these ideas work together and, as a group, comprise a strong foundation. These are the same concepts that I personally used to shape my destiny and attain my financial stability. I’ve formed the curriculum around these vital traits used by all multimillionaires. I especially want to tell you about the opportunities, since that section includes The MillionaireMaker Brains Trust, which will help you tap into a lifetime of learning and cash flow. This opportunity is open ONLY to those who own an individually numbered copy of The MillionaireMaker. 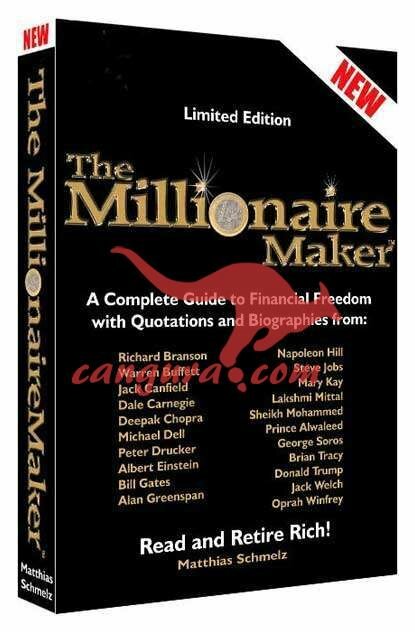 First, however, I want to introduce you to the multimillionaires whose biographies I’ve included in the book. As you read and absorb their stories – and have some “ah-ha” moments when you recognize something from their backgrounds that you can use in your own journey to millionaire status – you may begin to think of the group as. . . The MillionaireMaker strategy does not spring from the ivory towers of colleges and universities. It’s much more practical. These are down to earth, easy to learn tactics. Don’t be deceived by the simplicity of the ideas. Proven over generations – even centuries – the concepts and principles are deeply ingrained in the rich and super-rich, but often completely discarded by the “just-getting-by” or poor. The truth is, the wealthy put simple principles into action and keep acting on them until they reach their goals. The “secrets” have always been available to those willing to seek out the wealthy who tell them plainly what to do. A person either doesn’t seek out such information, refuses to believe the answers are so simple. . . or they don’t have the internal drive to implement the principles. Those who do, will change their lives. Those who don’t, won’t. It’s that simple. What others are saying about The MillionaireMaker. . .
""This book will help you achieve financial success faster than you ever thought possible""
“The MillionaireMaker is written by a man I have learned to know as a focused and dedicated businessman who knows how to create an exceptional business where most would say it is impossible. It is this internal power to focus on his goals and the simple tools he himself has proved to be effective that he is sharing with us in this book. My advice is that everybody who wants to create financial freedom for themselves and their family should read the book and follow the advice within it. If you do, I can guarantee that you will be better off than before. This might be your most important investment ever."" how-to-grow-rich strategies and secrets that you can easily apply”. P.S. Dobavni rok za knjigo je 7 dni.